plain GU and G2, after a McDonalds diet coke! People think I'm crazy and ask me why I run so much and I always respond the same way, "because I can." Because I can, and I love the strength it gives me mentally and physically. 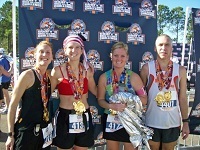 The Disney Marathons are always my favorites. I always do the Goofy, half Saturday and full Sunday. We always go as a group and have the best time taking pictures with the character and making friends along the way. Last year I "secretly" got 2 of my girl friends in under their goal time and had a blast the whole time. I love watching people achieve their goals, it’s a great moment to be a part of. 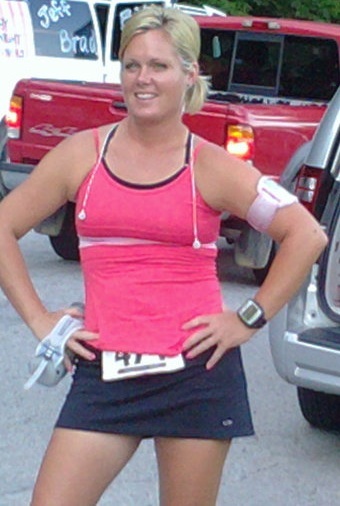 My best friend Jen had never broke 4 hours in all her years of running marathons. 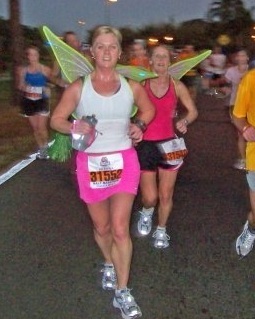 I paced her in the Flying Pig Marathon in Cincinnati. The most amazing moment was when she knew she was gong to achieve that goal with room to spare. Being with her as she crossed the line and break 4 hour (3:53) was an awesome experience I will never forget. I am very encouraging and talkative, which helps the time go by. I genuinely love running and have a passion for marathons. Bring your GU and a smile. Its hard to have a bad run when your smiling. I have 4 kids, age 11 to 3, so anyone can find time to train if I can. They keep me going, I have to keep up. My husband is very supportive, even when he can't understand why I run when I have a perfectly good car. Running is definately cheaper than therapy! I run the Youth Philanthropy Council for Floyd and Clark counties in Southern Indiana. I love being involved with this group, we teach local youth what it means to give back to your community and we are building the philanthropists of tomorrow.